I’m sitting atop the giant Torii Gate at Japan Kanto of the Hosoi Ichiba sim complex. I’m sitting here with Amiyru Hosoi the owner and creator of this amazing world, but we are looking at an empty sim where the entire Japan Chubu sim once was. Chubu is the sim that contained, among other things, the great Matsumoto Castle. It’s so ironic for me, because today I was coming to take photos of the castle and when I arrived the sim was wiped clear. The concierge has been notified but they have informed Ami that there is NO guarantee that this sim can be restored from backup. If you’ve ever seen this sim, you’ll understand that to rebuild it would be a massive undertaking of weeks if not months. There is nothing in Ami’s Lost & Found folder at the time of this writing. Japan Shubu and all it’s beauty is gone. I have told Ami that the odds are very high that Linden Lab can restore this sim from backup, but as you can imagine, she is heartsick. The ticket was submitted over an hour ago. We will continue to hope for the best. 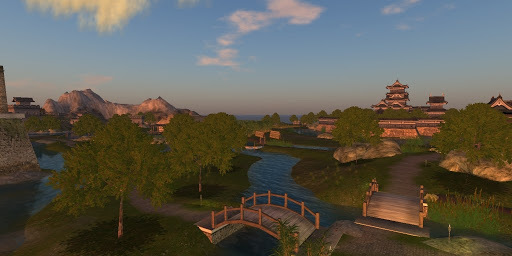 This entry was posted in Issues and tagged Linden Lab, Problems & Issues, Second Life. Bookmark the permalink. 100 YAYS 100 times !! It's back !! How awful that would have been!I am so happy for your friend. I hope it was all restored- sometimes there are missing items I hear.